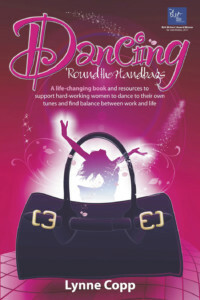 Dancing ’Round the Handbags’® (£19.99 Ecademy Press) is a more than a self-development book for hard-working women, it is a catalyst for changing and balancing the way we work and live. Using the metaphor of the ‘handbag’ and the ‘dance’, coach and Brit Writers’ Award winning author Lynne Copp helps you to dance your best life. The Dance is a metaphor for what you do each day; dance to the tunes of others. The multiple roles of mother, wife, boss, friend, daughter, colleague etc. means that you are so busy dancing to the tunes of others that you have little time to dance to your own dreams, aspirations and potential; your own music. The Handbag in this book is a metaphor for you. For example, The Mirror chapter explores your image; how you see yourself, The Lipstick chapter explores how you mask stress (‘put on a brave face’).